There are 9 Memory Care Facilities in the Stamford area, with 3 in Stamford and 6 nearby. The average cost of memory care in Stamford is $4,819 per month. This is higher than the national median of $4,650. Cheaper nearby regions include Yonkers with an average starting cost of $4,380. To help you with your search, browse the 8 reviews below for memory care facilities in Stamford. On average, consumers rate memory care in Stamford 5.0 out of 5 stars. Caring.com has helped thousands of families find high-quality senior care. To speak with one of our Family Advisors about memory care options and costs in Stamford, call (855) 863-8283. More than 75,000 seniors across the state of Connecticut have been diagnosed with Alzheimer's disease. With a population of around 130,000, Stamford, Connecticut's third largest city, is home to three memory care facilities to serve seniors with dementia and other cognitive impairments. There an additional 16 facilities in neighboring communities. In Stamford, and all of Connecticut, these facilities are known as Alzheimer's special care units (SCUs) and, as required by the state's Department of Public Health, they have supplementary licensing that permits them to provide specialized care and services for individuals with Alzheimer's disease or dementia. The cost of living in Stamford is 30.3 percent higher than the U.S. national average. The largest contributing factors to this influx are housing costs and utilities, which may be important for seniors on a fixed income to consider when choosing a memory care facility. The state of Connecticut as a whole is known for its low crime rates. In Stamford, rates of violent crime score a 24.8 out of 100, and property crime receives a 23.9, much lower than the national averages of 38.1 and 31.1 in the same categories. In fact, the Bridgeport-Stamford-Norwalk metropolitan area is ranked as the 11th most secure large metropolitan area to live in the United States, a comforting statistic for seniors and their families. Compared to other cities across the state, Stamford's climate is relatively temperate, though it still only receives a 51 out of 100 in terms of overall comfort. While summer highs can reach 84 degrees, winter temperatures can drop to the low 20s, with roughly 30 inches of snow expected each year. It's important to check with individual facilities to see what security measures they have in place to prevent seniors from wandering out in the cold. The Bridgeport-Stamford-Norwalk metropolitan area is home to world-class medical facilities, such as the Norwalk Hospital, whose award-winning Neurology and Stroke Center offers specialized care in brain health and dementia. The Greenwich Hospital, one of 300 hospitals across the country participating in NICHE (Nurses Improving Care for Hospitalized Elderly), is also located just a short drive away. Memory Care costs in Stamford start around $4,819 per month on average, while the nationwide average cost of memory care is $4,800 per month. It’s important to note that memory care rates in Stamford and the surrounding suburbs can vary widely based on factors such as location, the level of care needed, apartment size and the types of amenities offered at each community. Stamford and the surrounding area are home to numerous government agencies and non-profit organizations offering help for seniors searching for or currently residing in an assisted living community. These organizations can also provide assistance in a number of other eldercare services such as geriatric care management, elder law advice, estate planning, finding home care and health and wellness programs. To see a list of free memory care resources in Stamford, please visit our Assisted Living in Connecticut page. 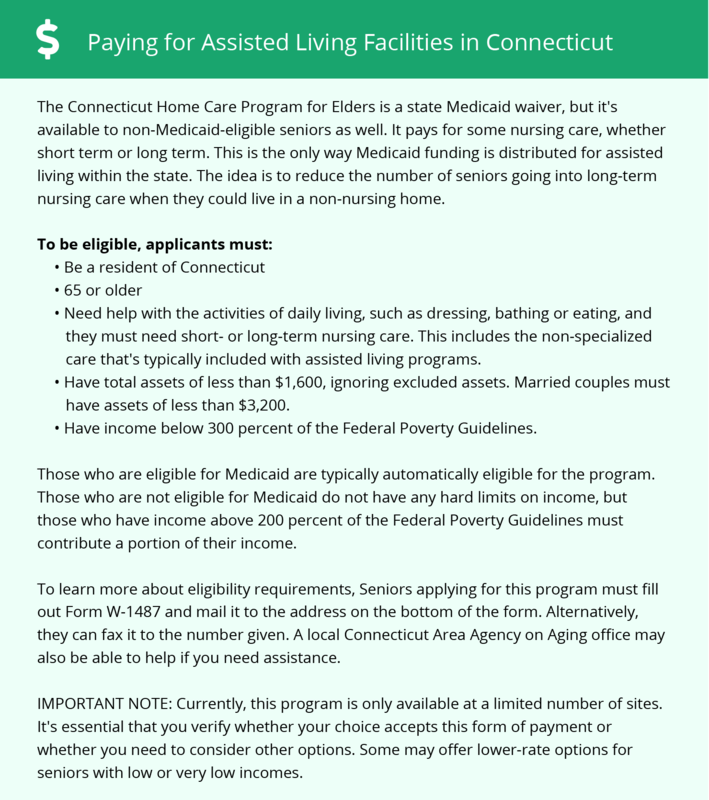 Stamford-area assisted living communities must adhere to the comprehensive set of state laws and regulations that all assisted living communities in Connecticut are required to follow. Visit our Memory Care in Connecticut page for more information about these laws.